In the VICTR Lab, Associate Professor Jorge Peña and students study communication technology—how people interact with the Internet, video games, virtual reality and other digital technology, and how these interactions affect real world behavior. On the other side of the window a research participant waits to talk with Emily in virtual reality. After briefing the participant, her lab partner, Abir Rahman, walks in the room and tells her it’s time to begin the experiment. “I’ve done so many of these, I know the drill,” she says. She puts on an Oculus Rift headset that covers her eyes and ears and then stares at the computer screen until a virtual environment appears. 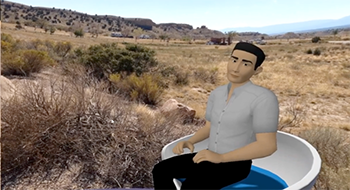 A blonde female avatar representing the participant sits in a chair in an uneven chaparral setting with shrubs, a trail, and off in the distance, a house. The camera shifts as Emily moves her head to look at the avatar. Emily doesn’t know if the avatar actually looks like the participant, nor has the participant seen the real Emily. Abir introduces the avatars to each other, and Emily begins the virtual conversation. Welcome to the UC Davis Virtual Interaction and Communication Technology, or VICTR Lab where Associate Professor Jorge Peña and his large team of students study communication technology—how people interact with the Internet, video games, virtual reality and other digital technology, and how these interactions affect real world behavior. Since the VICTR Lab’s inception, Peña has been particularly interested in how these new technologies affect how we view ourselves, and the automatic processes that occur when we encounter them. The VICTR Lab opened shortly after Peña’s arrival at UC Davis in 2013. At first, all data collection was done by graduate researchers. It has since expanded to involve undergraduate students, two rooms and a more interdisciplinary approach. “It’s been a gradual process of building the lab, but right now it’s in very good shape,” said doctoral researcher Subuhi Khan, who has been working with Peña since the lab’s humble beginnings. The most common form of research done at the lab is avatar manipulation. Participants are asked to create an avatar and given instructions to make it look like or unlike themselves, depending on the experiment. They then have a conversation in one of these virtual environments with another avatar that the team controls. They test how people react to different-looking avatars in different environments, often using avatars that imply social stereotypes. They have looked at how race/ethnicity, gender, body size, and the color of the avatar’s clothes have affected responses. According to Khan, this is a popular area of research for undergraduate research as well as a major interest of Peña’s. This was the type of experiment Emily and Abir were running. In that particular experiment, designed in collaboration with visiting Mexican scholar Salvador Alvídrez, half the participants conversed in the chaparral setting while the other half conversed in a UC Davis-themed environment. Emily was using an avatar named “Maria,” who is supposed to be a female student born in Mexico. The goal was to see whether having the common group identity of “UC Davis student” carried over to the virtual world and whether it would improve the participant’s perceptions and attitude toward a Latino student, Maria. One of the lab’s best-known studies found that players using an obese-looking avatar were less physically active while playing a motion-based tennis game than players using a thin-looking avatar. The effect was replicated with men and women. The findings, published in February 2016, attracted media coverage from CBS San Francisco, Canada’s CBC and India’s NDTV, among others. In another paper published in March 2017, Subuhi Khan and Peña reported that persuasive messages given to participants before playing mental health-oriented video games can help treat depression by making them feel like they are in control of their illness. A forthcoming paper looks at how anti-drunken driving advertisements embedded in the background of first-person shooter games persuaded participants not to drive or ride their bikes under the influence. Peña and his team are constantly coming up with new ideas for possible studies, which keeps the lab as busy as any on campus. “He’s got a great attitude in terms of encouraging new ideas,” Khan said of Peña. The influx of new ideas keeps the lab organized and constantly busy. Each experiment has a team that consists of a graduate or undergraduate researcher and two or three undergraduate research assistants like Emily and Abir who run the experiments and interact with participants. Experiments are scheduled in half-hour to hour sessions from 8 a.m. to 5 p.m., Monday through Friday, with anywhere from eight to 15 research assistants rotating in and out each week. Procedure is an extremely important part of the VICTR Lab. It sets a high standard for data collection, making sure to repeat the same procedure over a hundred times to improve the reliability of their findings. This requires thoroughly planning each procedure and adequately training research assistants to follow it. This explains Emily’s familiarity with the experiment drill and the dramatic “RECORD the Session or DIE!” sticky note. 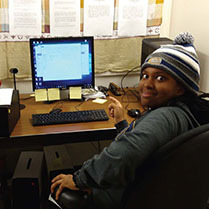 “It’s bittersweet understanding that there’s a very tedious process to it, but it’s something that’s ultimately worth it, and we stress those principles,” said Michael Carter, a graduating senior recently admitted to the Communication graduate program. Carter was taking one of Peña’s classes when he joined the lab. When he got an idea for his own research project, he pitched it to Peña, and soon he was conducting an independent study about the effect viewing Facebook profiles has on how we see ourselves and how we think others see us. “It became a very immersive task and it opened up a lot of doors and a lot of experiences that I wouldn’t normally have if I didn’t pursue this opportunity just going through my normal coursework,” he said. He plans to continue his research in the lab as a graduate student. Subuhi Khan, a fourth-year doctoral researcher who is developing an app to help people with depression ease their symptoms, said she's gained broad training from doing research from inception to publication. Getting involved with the VICTR lab is easy. Students of all experience levels can apply to join either as research assistants like Emily and Abir, who help run the experiments, or as independent researchers like Carter, who design and conduct their own studies. The lab has also taken an increasingly interdisciplinary approach, collaborating with computer science students to develop the apps and virtual environments used in their studies.